At Unity Days, the cast shared a lot of The 100 season four “non-descript” spoilers and certain surprises. However, it very safe to say the cast is very excited about season four. I will share them for your pleasure. Oh, I am still on that Unity Days high! Eliza Taylor said that there will be lots of mother and daughter action. She also said that she loves working with Paige Turco, and there is never a dull moment. In an answer to a question that I have asked, Clarke gets her softer side from her father Jake and her strength from Abby. Speaking of the latter, Clarke will address the relationship of Abby and Kane and will be expressive. Clarke will be grieving for Lexa, as she was “the love of her life.” She loved working with Alycia Debnam-Carey, and the two are great friends. Alycia is from what I gathered, a sweet storm on set. Meaning she works very hard at her craft, but enjoys it and has fun. Yet, Clarke will have to push herself forward and fight for everyone’s survival. She will use words more rather than firearms to negotiate. Also for Bellarke, it has yet to be determined. On a personal level, I find the two of them working together is essential, but perhaps not in the romantic sense. I don’t know, though, but if it happens, I won’t complain. Nor will I get insane. Bellamy will not be sidelined this season and will try to rectify the mistakes that he made last season. He and his sister Octavia solve their problems by acting out violently, but that needs to stop. Yet, Bellamy knew that it was a way for Octavia to release her grief. Bellamy will also be more determined to be the leader that everyone deserves. Bellamy would have taken the Chip for Octavia and Clarke, as he cares for them more than anyone. In addition, Bellamy has a xenophobic shadow over the Grounders as they had not been loyal and true to him and the others. Tasya shared that Echo is not as cold as she seems, and was following her Queen’s orders. However, there is one person that she trusts. Jackson is morose because he has been through hell and back. In addition to being a young doctor, Jackson wants to make his parents proud, who were also doctors on the ARK. When his parents passed, Abby “adopted” him, and this is why their relationship is strong. Also, whilst running tests on the “Chip,” he takes it because he feels like it was an escape. Monroe was locked up on the ARK because she got revenge when her boyfriend stared at another girl. There was a whole scene that revolved around it but was cut out due to budgeting. Miller will have trouble in the relationship persuasion, but he will also try to be a better leader and make his father proud. Murphy does not give a crap about Emori having a disability. Not at all. Lindsey said that Raven will be going through a lot this season, and with the upgrade, it will be hard. But Raven will pull through. Murphy will be discussing of what happened to him, and how it affected him. This is a very serious issue, and must not be taken lightly. Monty will have issues with Bellamy, but he and Harper are very much concrete. Also, he may reflect on killing his mother. Hope will be definitive for season four. As well as sacrifice, and self-redemption. The 100 revolves and evolves around humanity. Race, disability, orientation, gender roles, age, income, and other things that we can be “described” as are irrelevant. Everyone is trying to survive and trying to figure out what is right, and their purpose on Earth. Ooh, now for some tech stuff! The dropship is left in the forest all year round in the forest. I wonder what the hikers think of this? A scene can take several hours to shoot so the right emotion can be projected. A clear example of this is the near suicide scene of Murphy in Wanheda Part One. Bottle episodes are cheaper to shoot because they’re in one location. Each actor on the show prepares themselves emotionally, mentally, and physically for their characters. Their characters are “emotional, traumatized trainwrecks” and can be hard to project. The Dead Zone scenes was actually a small sand dune. Different camera angles and effects manipulated it to make it appear larger, and all over. Due to contractual clauses, and network policies, the cast is not allowed to share spoilers on social media and at events. The cast and crew were oblivious that season three had sixteen episodes, so 3A was time compressed. 3B was more fluid and smoother. A typical shoot/filming day will last about 14-16 hours. Due to budget and timing, there are hundreds of scenes that did not make the final cut. Twitter can be a fireball, with nonsensical and cruel word vomit to others. Please be nice as this upsets more than you know. I think that I pretty much summed up everything. However, if you felt like I have missed something, please let me know! The 100 will air its fourth season February 1st on the CW.? 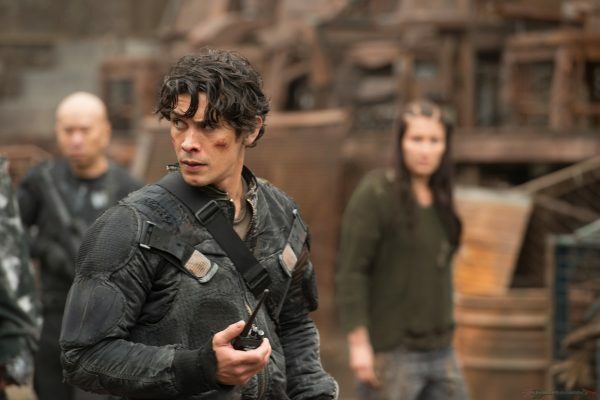 Follow Grounders Source on Twitter @GroundersSource and Facebook @GroundersSource. You may also leave a comment below.